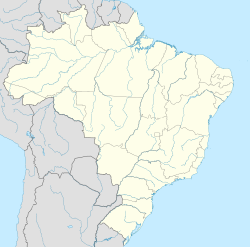 Macapá is a city in Brazil, population 397,913 (2010 census). It is the capital of Amapá state in the country's North Region. It is located on the northern channel of the Amazon River near its mouth on the Atlantic Ocean. The city is on a small plateau on the Amazon in the southeast of the state of Amapá. The only access by road from outside the province is from French Guiana, although there are regular ferries to Belem, Brazil. Macapá is linked by road with some other cities in Amapá. The equator runs through the middle of the city, leading residents to refer to Macapá as "The capital of the middle of the world." It covers 6,407.12 square kilometres (2,473.80 sq mi) and is located northwest of the large inland island of Marajó and south of the border with French Guiana. Macapá, 1969. National Archives of Brazil. Macapá is a corruption of the Tupi word macapaba, or "place of many bacabas", the fruit of the local palm tree. The Spaniard Francisco de Orellana claimed the region in 1544 and called it Nueva Andalucía (New Andalusia). The modern town began as the base of a Portuguese military detachment, stationed there in 1738. On February 4, 1758 Sebastião Veiga Cabral, the illegitimate child of the military governor of Trás-os-Montes, Sebastião Veiga Cabral, founded the town of São José de Macapá, under the authority of the governor of Pará, Francisco Xavier de Mendonça Furtado. The fortress of São José de Macapá was first laid out in 1764, but took 18 years to complete, due to illness among the Indian workers, and numerous escapes made by black slaves. Macapá was elevated to city status in 1854. Macapá gained international notoriety in December 2001 when international yachtsman Peter Blake, from New Zealand, was murdered while anchored on his explorer yacht Seamaster in Macapá port. According to Business Insider, Macapá is the 45th most violent city in the world, with 32.06 homicides per 100,000 people. Macapá has a population of 499,166 in its metropolitan area, the third largest in the North Region. The city alone accounts for 60% of the population of state of Amapá and 3.50% of the population of the entire northern region of Brazil. According to the 2010 census, the city has a population of 397,913, of which 97.92% live in urban areas and 2.08% live in rural districts. With an area of 6,563 square kilometres (2,534 sq mi), the population density of Macapá is approximately 60.62 inhabitants per km². Macapá has a few roads to other cities in Brazil and is mainly connected to the rest of the country by air and sea. Macapá is located 345 kilometres (214 mi) from Belém, but the cities are separated by the large inland island of Marajó and have no direct highway connections; the city is accessible only by boat or airplane. Macapá is connected to French Guiana by the Brazilian federal highway BR-156, which runs north of the city through the Amazonian jungle. The city is connected with the rest of the North Region via the following highways: the AP-010, linking Macapá to Santana to the southwest; the AP-030, linking to the city of Mazagão; the BR-156, linking to the south of Amapá and Laranjal do Jari; and the Ap-330, linking to the northern town of Oiapoque. The Oyapoque River Bridge has been open to traffic since 20 March 2017, linking Brazil and French Guiana by road for the first time. Macapá International Airport (officially: Aeroporto Internacional de Macapá – Alberto Alcolumbre) is located 3 kilometres (1.9 mi) from the city center and serves as a vital link between Macapá and other cities in Brazil. Commercial flights connect the Macapá to Belém, Brasília, Fortaleza, Recife Airport, Rio de Janeiro, Salvador, and São Paulo. The airport traces its history to a small air base built by the United States during World War II to secure strategic bases in the South Atlantic region. Macapá is an economic center of northern Brazil and serves as a commercial hub of the state of Amapá. Gold, iron, lumber, manganese, oil, timber, and tin ore from the interior of the state pass through Amapá on to Port Santana in the neighboring municipality of Santana. It is the fifth wealthiest city in northern Brazil, with a GDP of R$2,826,458,000 (2005). The city has a notably high rate of economic growth and a per capita income of R$7,950 (2005). The fortress of St. Joseph is a Vauban-style star fort built between 1764 and 1782 to replace two previous fortifications located in the city. It was built to safeguard the northern extremity of Brazil and to control the estuary of the Amazon. It is one of the main sights of the city of Macapa. The Marco Zero monument was built to mark the position of the equator in the city and to show the passage of the sun. At the spring and the autumn equinox the sun rises and sets on the line of the equator and shines on the monument along the Avenue Equatorial, which runs for a mile due east of it. The Estádio Milton Corrêa, usually known as the Zerão (“Big Zero”, from its position on the equator), is a multi-purpose stadium located in central Macapá on the R. Ilvaldo Alves Veras east of the university (UNIFAP). The stadium has a maximum capacity of 10,000 people and was built in 1990. It is used mostly for football matches and hosts the home matches of several local teams. The municipality contains the 111-hectare (270-acre) Parazinho Biological Reserve, created in 1985 to protect an island in the Amazon river. It contains the 21,676-hectare (53,560-acre) Rio Curiaú Environmental Protection Area, created in 1992 to protect an area near the urban center from city sprawl, and to protect the culture of the traditional inhabitants. It contains the 137-hectare (340-acre) Fazendinha Environmental Protection Area, created in 2004. The Macapá region includes large tracts of tropical rainforest and experiences relatively high rainfall. Macapá features a tropical monsoon climate (Am) under the Köppen climate classification, with a lengthy wet season from December through August, and a relatively short dry season that covers the remaining three months. However, a noticeable amount of rain is observed even during the dry season, a trait common to a number of other areas with this climate. Average temperatures are relatively consistent throughout the year, hovering around 23 °C (73 °F) in the mornings and 31 °C (88 °F) in the afternoon. ^ a b c "Macapá". Encyclopædia Britannica. Encyclopædia Britannica Inc. 2015. Retrieved May 13, 2015. ^ a b Nunes Torrinha, Mário (2015). Macapá : redes, comércio, tempo e espaço na formação do labirinto urbano (in Portuguese). Judiaí, SP: Paco Editorial. ISBN 9788581488516. ^ "Sir Peter Blake Murdered". TV NZ. Retrieved June 6, 2013. ^ Pamela Engel; Christina Sterbenz; Gus Lubin (November 27, 2013). "The Most Violent Cities In The World". Business Insider. Retrieved November 30, 2013. ^ "Aeroporto Internacional de Macapá - Alberto Alcolumbre" (in Portuguese). Brasília DF, Brazil: Ifraaero. 2015. Archived from the original on March 4, 2016. Retrieved May 13, 2015. ^ Ports & Terminals Guide. 1. Redhill: IHS Maritime and Trade. 2014. p. 526. ISBN 9781906313753. ^ GDP (PDF) (in Portuguese). Macapá, Brazil: IBGE. 2005. ISBN 85-240-3919-1. Archived from the original (PDF) on October 2, 2008. Retrieved July 18, 2007. ^ per capita income (PDF) (in Portuguese). Macapá, Brazil: IBGE. 2005. ISBN 85-240-3919-1. Archived from the original (PDF) on October 2, 2008. Retrieved July 18, 2007. ^ a b c d "Normais Climatológicas Do Brasil 1981–2010" (in Portuguese). Instituto Nacional de Meteorologia. Retrieved November 15, 2018. ^ "Station Macapa" (in French). Meteo Climat. Retrieved November 15, 2018. ^ "Macapa (82098) - WMO Weather Station". NOAA. Retrieved March 27, 2019.